This photograph is of brilliant fall colors backed by a stunning white cross, crisp blue sky, and beautiful architecture. 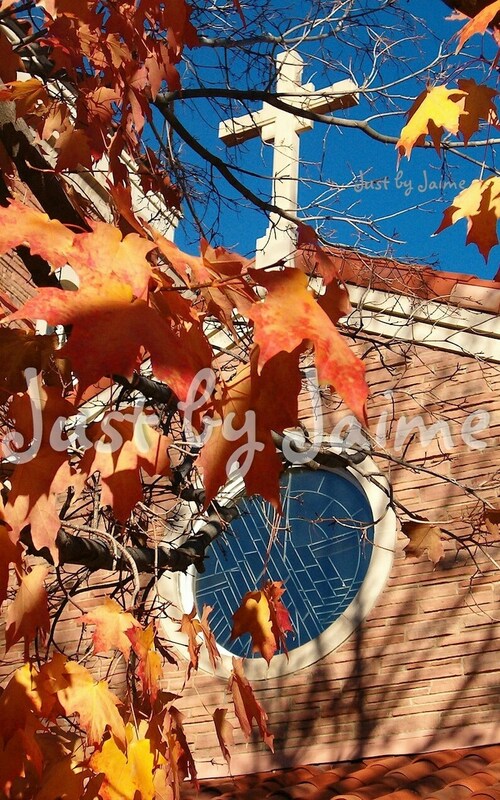 The photo was taken at St. Thomas Aquinas Catholic Church in Boulder, Colorado. It is a great inspirational gift idea. You can choose between a set of 4 4x6s, a 5x7, or an 8x10. The 4x6s make a wonderful Christmas gift for bible study members, discipleship partners, or ministry leaders. This photograph is one of the items in the November 2017 God's Glory Box. Photographs are wonderful for your home or office or to be given as gifts. The photographs are printed on matte photo paper. Photographs are shipped unframed and unmatted to allow you to choose the mat and frames of your choosing. 8x10 is not proportional to the negative. The photograph that you see in this listing will be cropped slightly. If you are interested in having the photographs printed on items (like mugs, coasters, etc.) rather than enlargements, please contact me about how to go about doing so. If you are interested in ordering a large quantity and variety of prints for your home or business, please contact me about those options.